Sigmund Groven's official website – Everything about the musician, composer, artist. As of August 2018, Sigmund is a harmonica teacher at the Norwegian Academy of Music. The academy is the highest level of music education in Norway. News about current, recent and future music and recordings. Past recordings are listed on the discography page. Bønn for drømmen (“Prayer for the Dream”) the album was released by Grappa on December 8th, to coincide with the Centenary of poet Hans Børli, and the Børli concert at the Norwegian National Library. Read more about the album (på norsk her). Bønn for drømmen (Prayer for the dream) – new CD out now. Venues are in Norway unless otherwise mentioned. May 18th, Denmark: Concert at BOK (Bibliotek, Borgerservice & Kulturhus) in Nykøbing in Odsherred on Sjælland, Denmark, celebrating the Centenary of Foreningen Norden (The Nordic Associations). Sigmund joins Birgitte Grimstad (vocal, guitar) and Per Husby (piano). June 3rd, Oslo: Concert at the Norwegian National Library, with Birgitte Grimstad, Per Husby, and Sigmund. Per Husby, Birgitte Grimstad, Sigmund Groven. August 8-11th, Tvedestrand: NMF (Norwegian Harmonica Forum) Summer Seminar. Sigmund is one of the teachers, together with Tore Reppe, Vegard Austlid Kjøsnes, and Ivar Anton Waagaard. Concert time and venue on Sunday August 1th TBA. The seminar takes place at Risøya Folkehøgskole in Tvedestrand. September 14th, Klepp: “På kino i kveld” (Music from the Movies) with Norwegian and Nordic film tunes; Sigmund as part of the quartet Oss Fire (with Tone Elisabeth Braaten, soprano, Lars Klevstrand, vocal and guitar, and Ivar Anton Waagaard, piano) at Friluftshuset Orre. September 15th, Notodden: Sigmund and Iver Kleive (organ and piano) celebrate 40 years of collaboration. 7 pm at Notodden Church. November 2nd, Notodden: Sigmund and Lars Klevstrand (vocal,guitar) join Notodden Mannssangforening (Notodden Men’s Choir) in a tribute to Erik Bye. Details TBA. 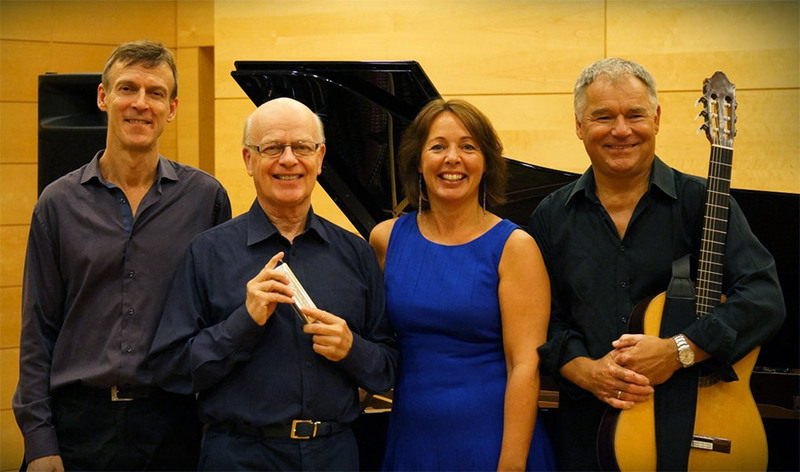 The quartet Oss Fire (The four of us): Ivar Anton Waagaard, Sigmund Groven, Tone Elisabeth Braaten and Lars Klevstrand.